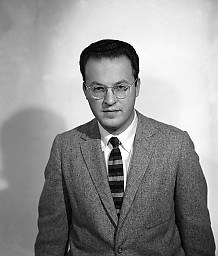 American physicist Donald A. Glaser won the 1960 Nobel Prize for Physics, for his 1952 invention of the bubble chamber. Colloquially described as a pressure cooker with windows, the bubble chamber is a transparent and water-tight case filled with an almost boiling-hot liquid. It is an elegantly simply device which takes advantage of a quick of nature — as charged atomic particles are accelerated by an atom smasher and then beamed through the chamber, the trajectories of ionizing particles' leave a visible trail of bubbles in the liquid. These bubble trails are then photographed, and the pictures can be analyzed to allow precise measurement of the paths of subatomic particles. In his earliest experiments, Glaser used beer as the heated liquid with little success, but his more practical bubble chambers used diethyl ether and liquid hydrogen. Early chambers were a few centimeters in diameter; later chambers exceeded two meters in size, with automated measuring and calculation apparatus. Glaser's invention was for decades second only to the cyclotron in its value to research into electrically charged particles, but the bubble chamber has been largely supplanted by more advanced systems including multi-wire chambers, drift chambers, and semiconductor radiation detectors. He conducted research across a broad spectrum of science, including branching ratios in positive K meson decay, computational modeling of human vision, deoxyribonucleic acid (DNA) synthesis in bacteria, parity violation in non-leptonic hyperon decay, pion-proton scattering, and the value of noise in complicated systems. From 1964 until his death in 2013 he was a professor of neurobiology at the University of California at Berkeley.